Adelia Apricot Quilt Bedding by VHC Brands | P.C. Fallon Co. 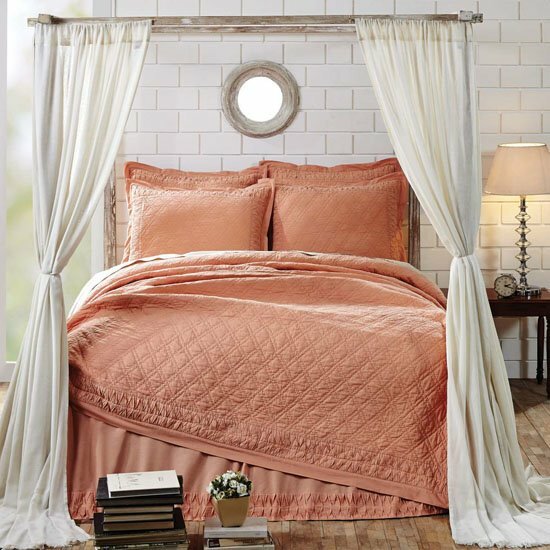 Echoing the look of antique European whole-cloth quilts, Adelia in Apricot solid color quilt bedding features sumptuous, touchable texture with hand-stitched diamond quilting meticulously covering the front and reverse. The hand-pleated border on all sides is finished with an additional vintage-style flat flange. The all-cotton fabric grows softer with every use. Lovely detail on the Adelia bedskirt includes hand pleating that echoes the detail of the quilt and shams. Adelia has that luxurious and sought-after heirloom look for high end appeal. Available pieces are the lovely quilt, standard shams, king shams, Euro shams and bedskirt. Choose all pieces of Adelia in apricot for a tone on tone look, or add pieces to other patterned bedding for a designer look. Machine stitched and hand-quilted. 100% cotton. Imported. Machine wash on gentle cycle.